The Denver Discovery School program encourages young learners to explore a variety of classes and extracurricular activities that lay the foundation for lifelong passions and success. In an effort to empower their students and staff with a visual representation, they are putting a logo sticker to good use. 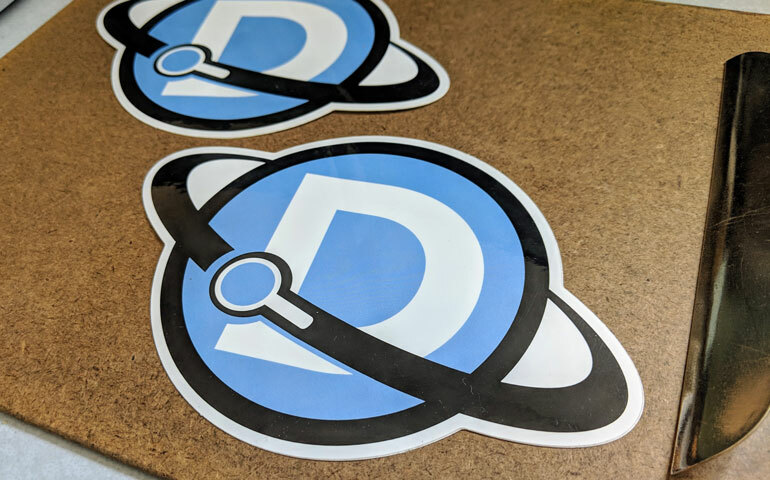 The "Discoverers" (that's their mascot) at Denver Discovery School have a custom shaped logo sticker featuring a light blue planet and a magnifying glass in orbit around the globe that will help them tell their story of academic excellence and school pride. Classroom experiences prepare them for high school, college, and career by connecting Common Core concepts to real life applications that open the door to undiscovered possibilities. From math, science, and engineering to social studies, art, and music they strive to give their Discoverers a well-rounded education that pushes learners of all ability levels. They want their students to navigate life’s challenges on their own while exemplifying their core values of leadership, collaboration, perseverance, compassion, gratitude, and discovery. Their classroom rigor, commitment to hiring excellent instructors, and student-empowering culture aims to grow students’ academic, social, and leadership capacities. The team at Denver Discovery School expects excellence in their students and they are consistently blown away by what their students can accomplish when they have the tools and skills to do so. The facility at Denver Discovery Schools boasts a state of the art gymnasium, classrooms equipped with smart educational technology, a large playground, and a full sized sports field that is functional not only for sports and Physical Education but also for outside classroom time. They have an on-site garden that provides hands-on math and science opportunities as well as art inspiration and outdoor classroom space. We think that they will discover a whole new way to share their school spirit with this bold representation of a school logo with these custom stickers.